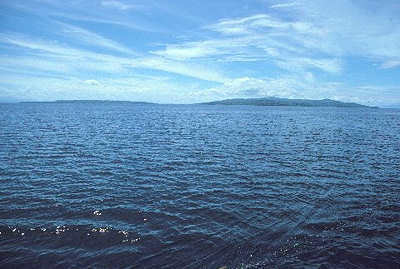 Mindanao, Philippines William Lessa discovered that Drake experienced an optical illusion whilst in the Gulf of Davao. Drake thought he saw foure Ilands. Consequently, this has hindered reconstructing this part of Drake's Far East track. Drake actually saw the two islands within the gulf's two arms. Since the gulf's head is not seen to join from the south of these islands, it gives the appearance that one is seeing foure Ilands. My boat excursion supported Lessa's fieldwork.